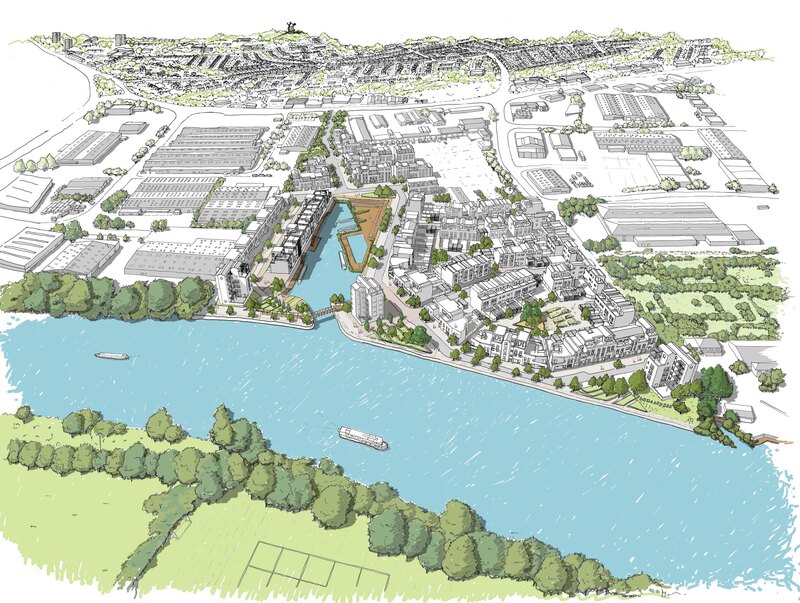 Trent Basin recently won the Urban Design Group Practice Award 2015, see the video here. Trent Basin lies on the north banks of the River Trent, within an established industrial estate.The site has been designated as a re-development site for a number of years and its proximity to Nottingham City Centre (within 1.5 miles) and its great spot on the river Trent opposite green open space, creates a wonderful opportunity for new housing. Together with the Homes and Communities Agency (HCA), developers Blueprint Regeneration and a team of designers are putting together proposals to build new houses on the site and create some beautiful public open space around the existing basin - a water inlet off the River Trent. The site used to be an employment site, housing a number of warehouses and industrial sheds. It is also surrounded by businesses, ranging from a Skate Park to a Tile warehouse. This it what makes the site unique, we believe that our proposals for housing will compliment nearby land uses, creating a mixed use, sustainable neighbourhood, in which people can live, work and enjoy. If you would like to be kept up to date with progress, please join our mailing list here. Phase one will provides 45 low-energy family homes that will be completed by spring 2016, with subsequent phases following over the next few years. URBED has been nominated for the annual Urban Design Group practice award for our work on the masterplan for Trent Basin in Nottingham. The winner is decided by a democratic vote, and so we would like to invite you to vote for us by following this link. Thank you! The planning application for our scheme was approved by Nottingham City Council’s planning committee in March 2014. Subject to final planning consent, work on Trent Basin is set to start this summer with the first phase of 41 homes completed in the autumn of 2015. 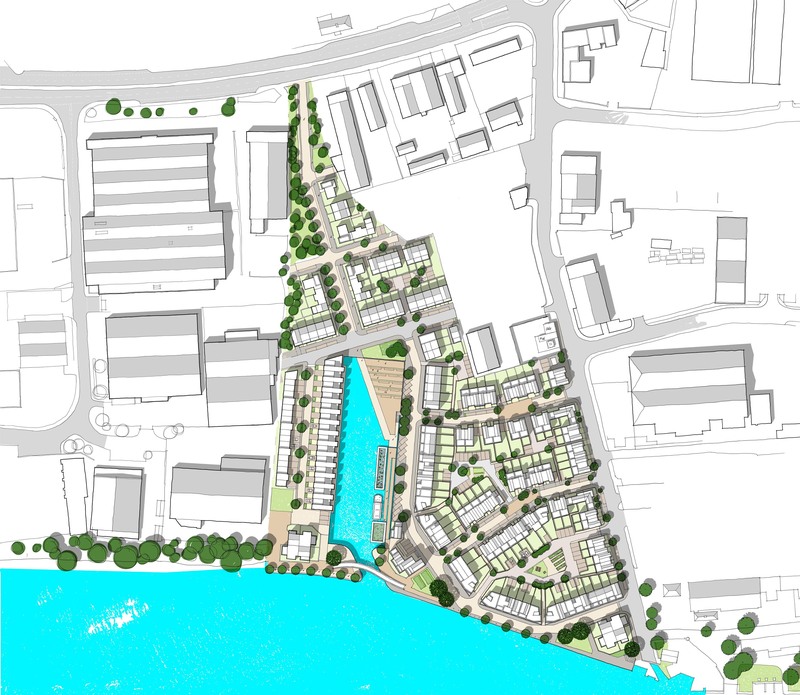 We have submitted a hybrid planning application for the re-development of the Trent Basin site in Nottingham. Our submission includes a full (detailed) planning application for Phase 1 of the scheme, and an outline planning application for future phases 2-5. The planning application will be determined by planning officers at Nottingham City Council. It will also be presented at a planning commitee in late February/ March (more details to follow). This will ensure that the scheme gets approval from local councillors. Our proposals have gone through a lengthy design review process to make sure our development on Trent Basin is of the highest quality. This process follows the Footprint guide, and this makes sure all aspects of the scheme promote a sustainable development – from making sure there are schools and fresh food shops close by to constructing energy efficient houses and building layouts which promote walking and cycling. We displayed these at our consultation event on the 3rd September, which took place at Nottingham Raceourse. The event was really successfull with 37 people tunring up to view our proposals. If you were unable to attend but would like to give your feedback please fill out an online questionnaire here.